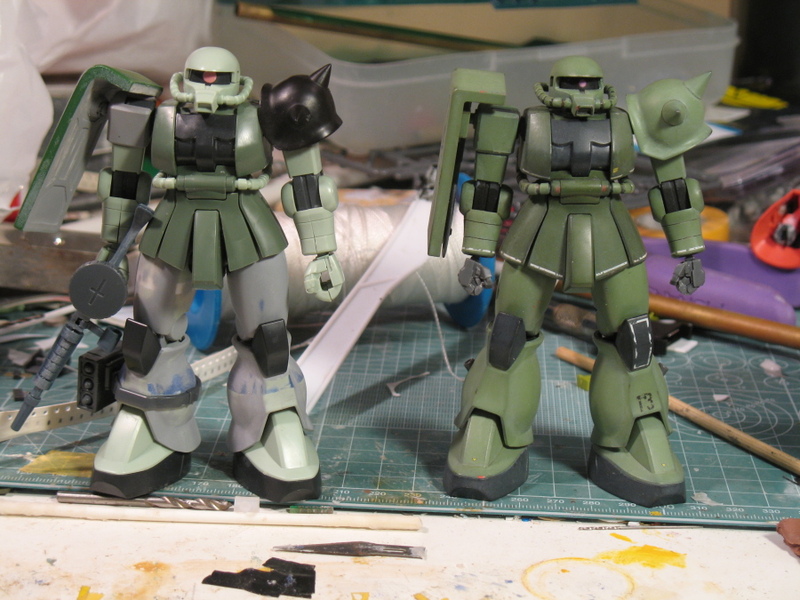 Since last time I’ve been spending a fair bit of time trying to improve the modified legs and get them to better match up with one another. 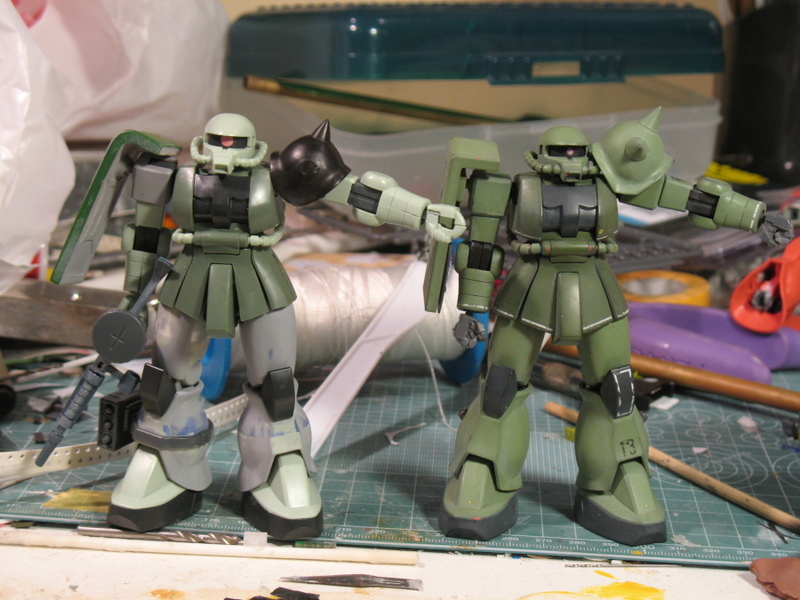 Additionally, I’ve recast the shoulder armor and permanently mounted it to the Zaku, and I’ve done a bit of work improving the look of the elbow joints. One thing about this kind of modification is that doing a modification once such that it looks decent may not be too challenging: but doing it a second time such that the second matches the first can be much more labor-intensive. In this case, I’ve been paying the price for a bit of sloppy work on the right leg. When I was fine-tuning the right leg to match the left, I wound up with some visible seam lines that have proven difficult to erase. 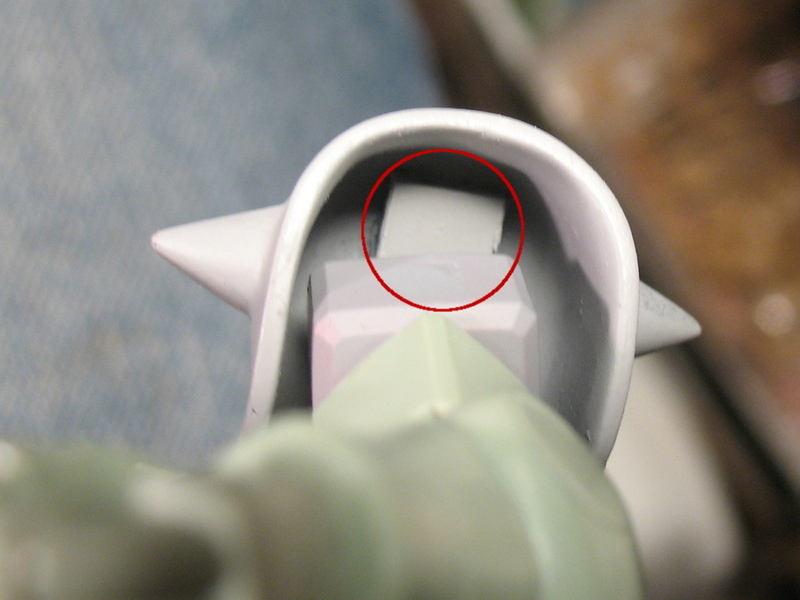 I think there were two basic causes for this: first, the styrene plates inserted into the leg to lengthen the upper right leg were never flush-cut to the same level of precision as those in the left. 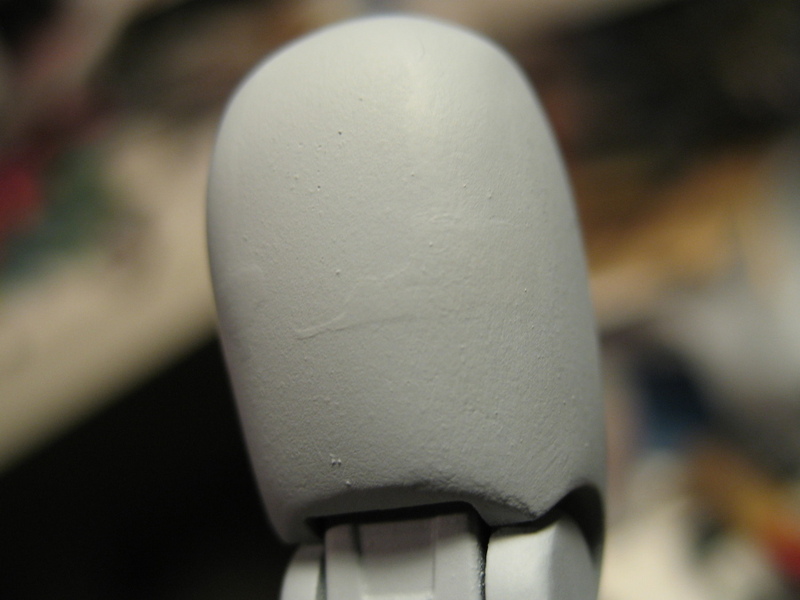 As a result, I spent a lot of time sanding those plates down but never quite smoothing out the transition. 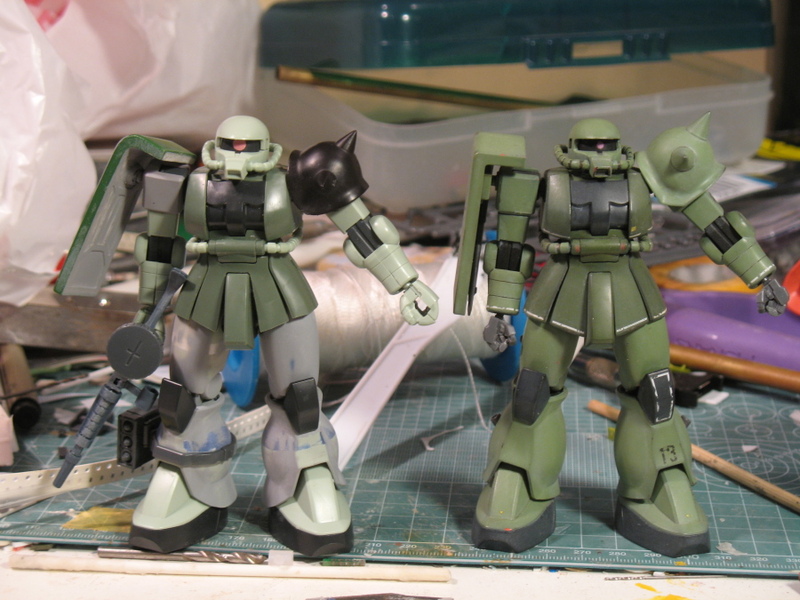 Second, when I pulled the assembly apart and re-joined it to tweak the length and make it match the left leg better, this left some small gaps. 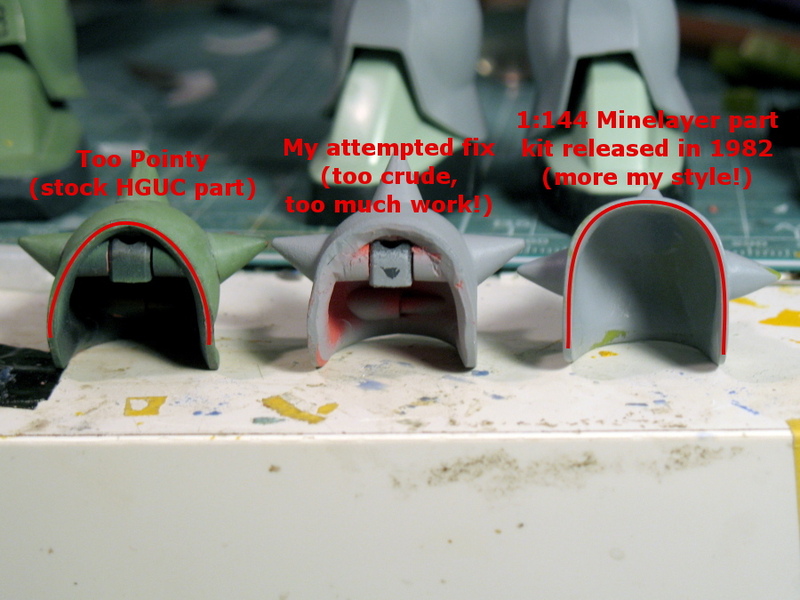 Anyway, the right leg has gone through multiple primer/sanding/repeat cycles in my effort to fix the issue. 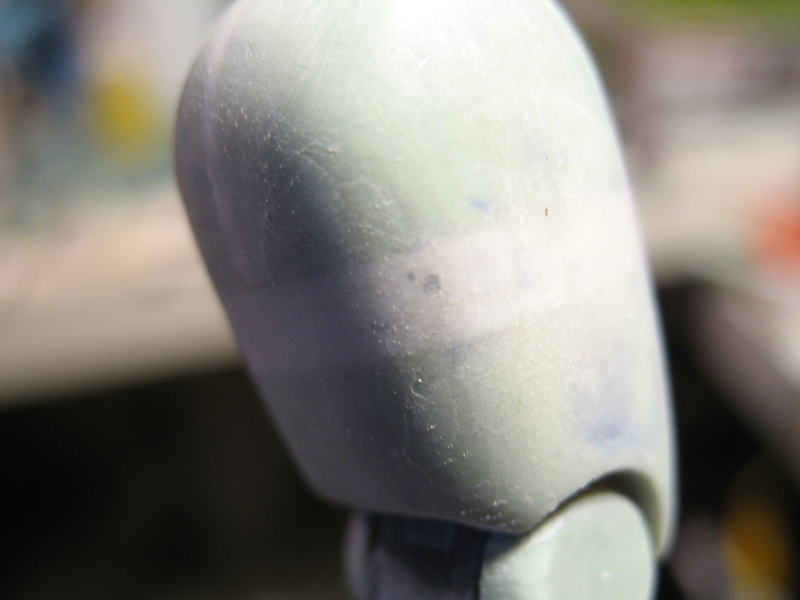 Finally, I wound up re-surfacing most of the part with super glue + talcum, which led to other difficulties, as the SGT had a tendency to chip away when sanded instead of feathering nicely. 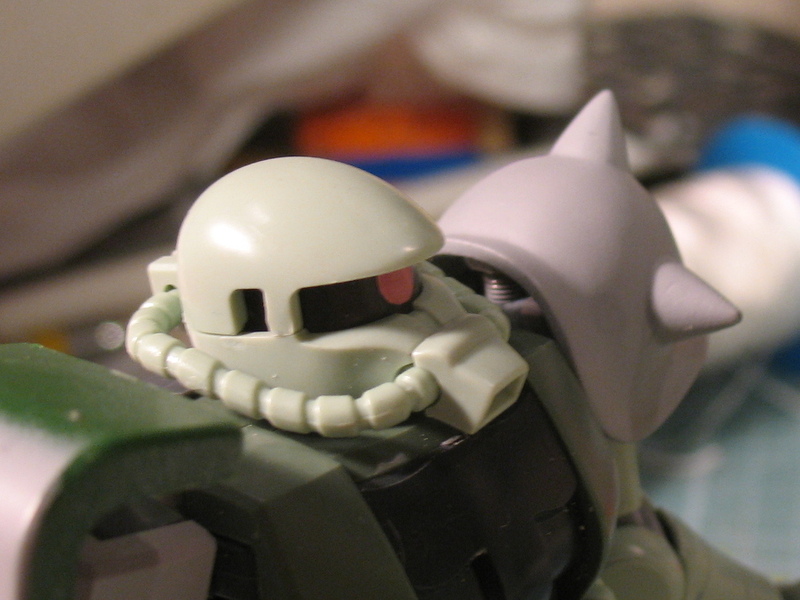 When working on the Zaku Minelayer shoulder armor for this project. I decided that I wanted to recast it. 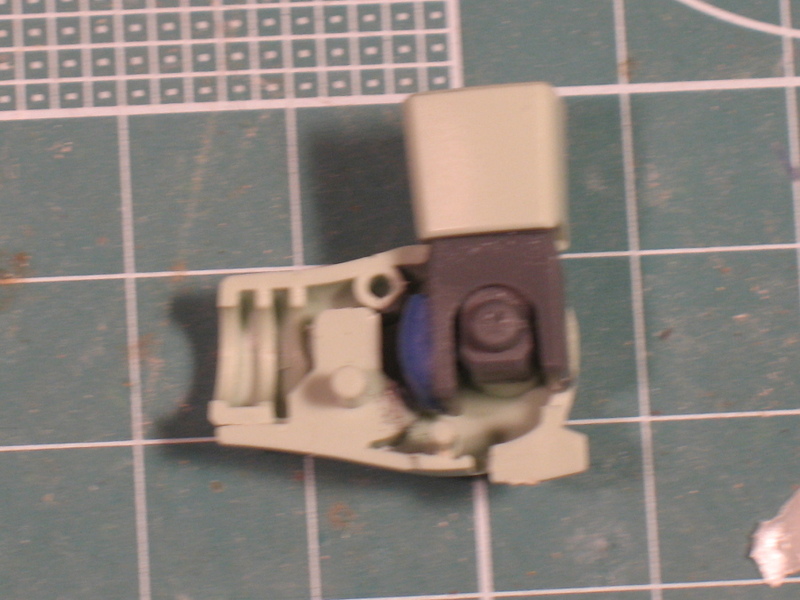 Normally recasting a part from a 400 yen kit would be pretty silly: but in this case, the part is from a kit whose availability these days is apparently rather hit-or-miss, and it did take a fair bit of work to get the part looking nice (filling sinkholes, sanding the seam, correcting minor issues with the part edge, etc.) so if I expect to be using the part on more projects in the future, it’s probably worth it. 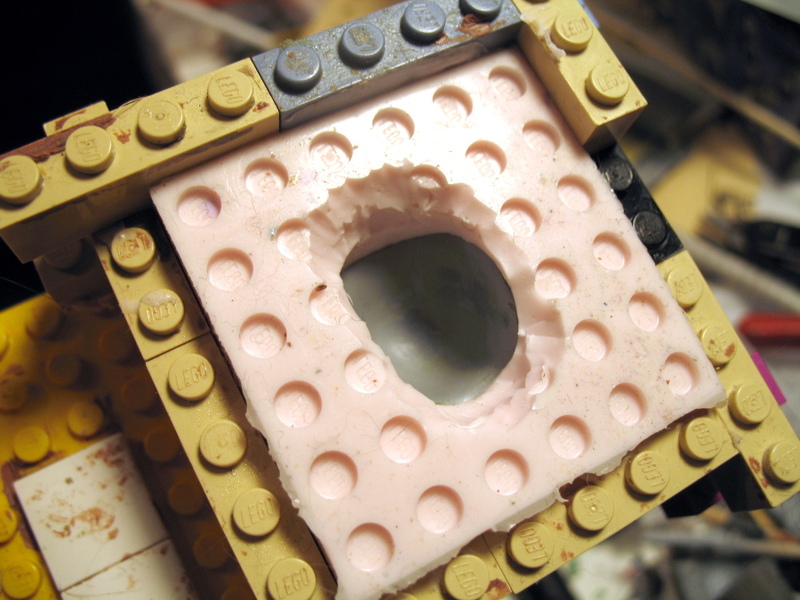 At any rate, I made the mold with rubber that had pretty much reached the end of its useful life.. which unfortunately meant the mold wound up with some bothersome air bubbles… But on the other hand, it means the mold rubber I used wouldn’t have been useful for anything else. 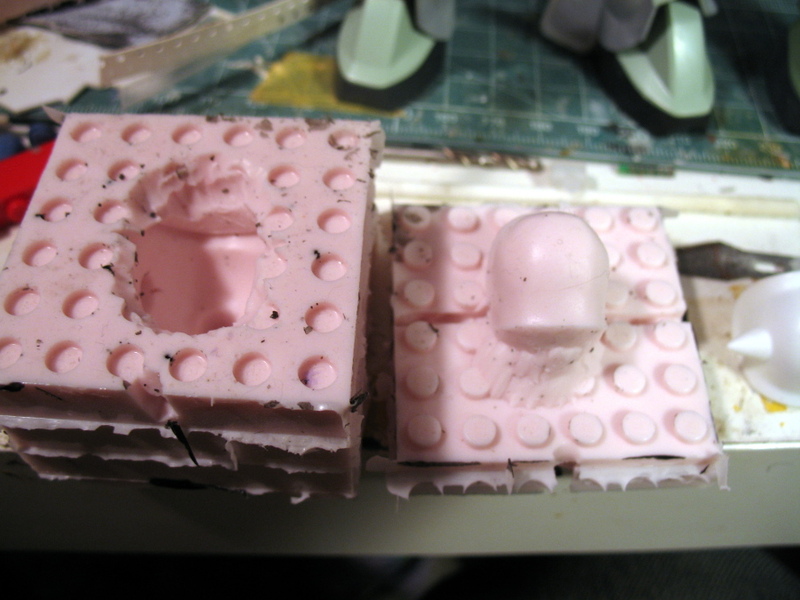 The biggest problem with this mold by far has been the air bubbles in the bottom half of the mold. 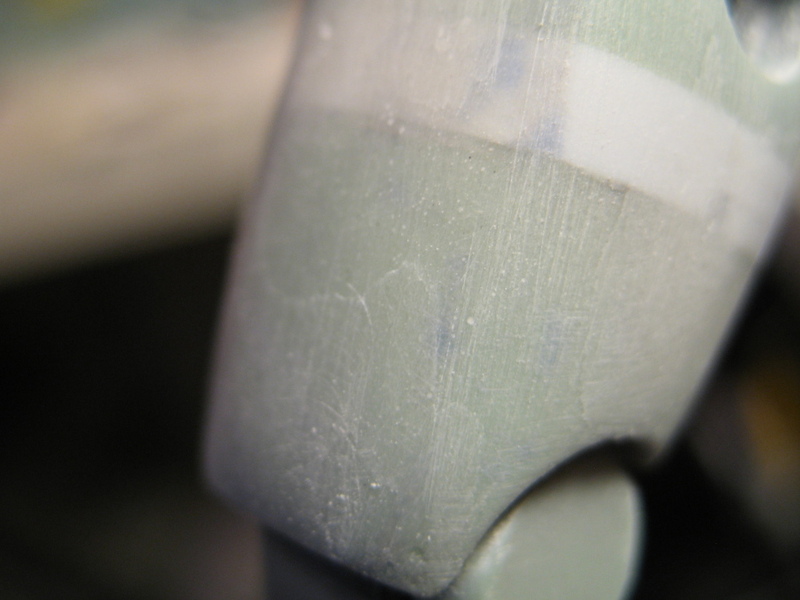 Several are close to the surface of the part – and what I found in early castings is that the air pressure in those bubbles actually produces little divots in the cast part. 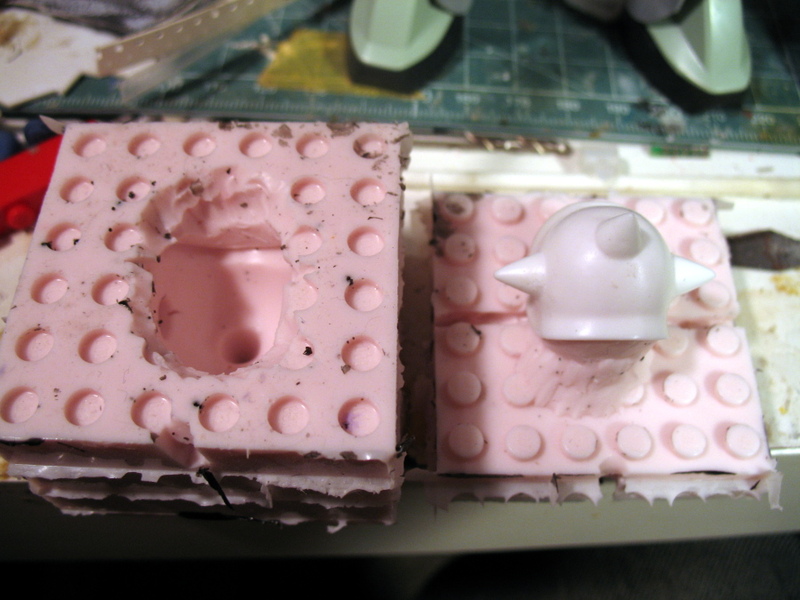 So to make the castings decent I had to cut those bubbles open… And to keep surface tension from turning those cut-open bubbles into an even bigger problem, I had to cut them open far enough that resin would reliably flow in during casting. 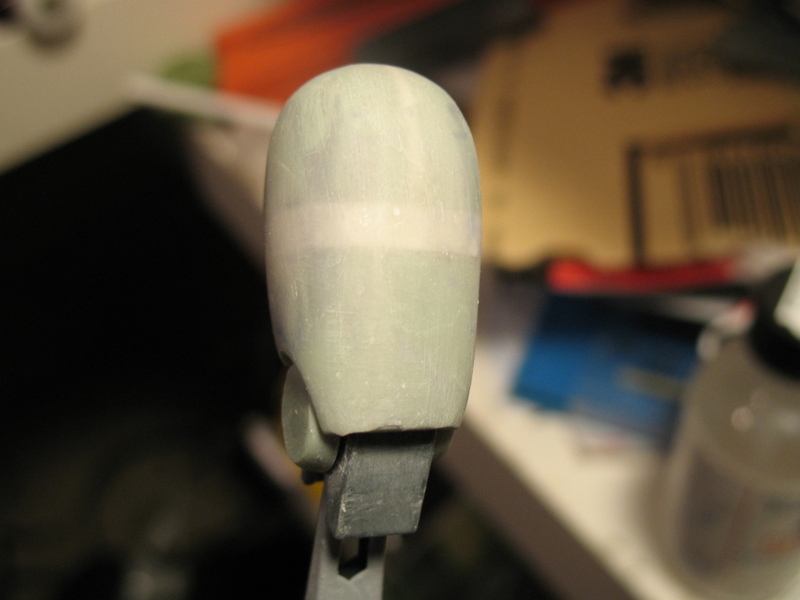 This, of course, means a lot of cleanup work on the finished castings. 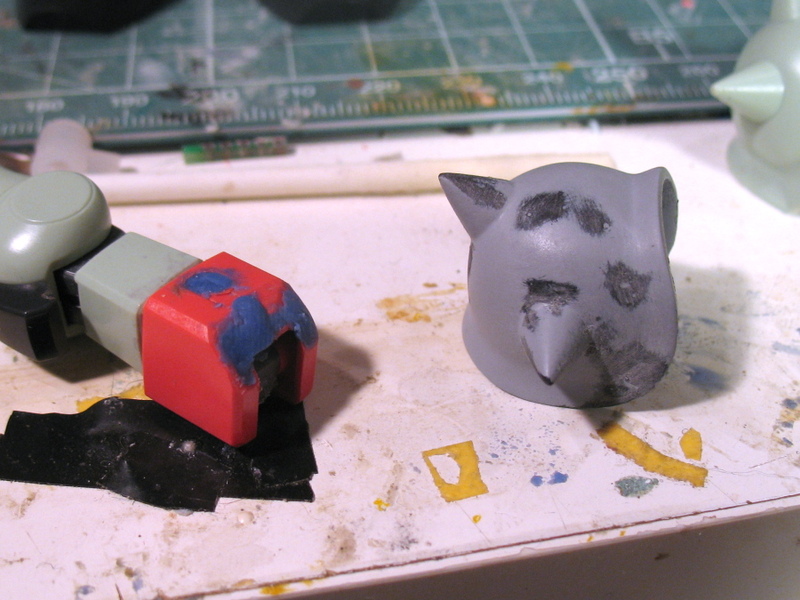 I may make new molds of this part in the future if these defects prove to be too much trouble. 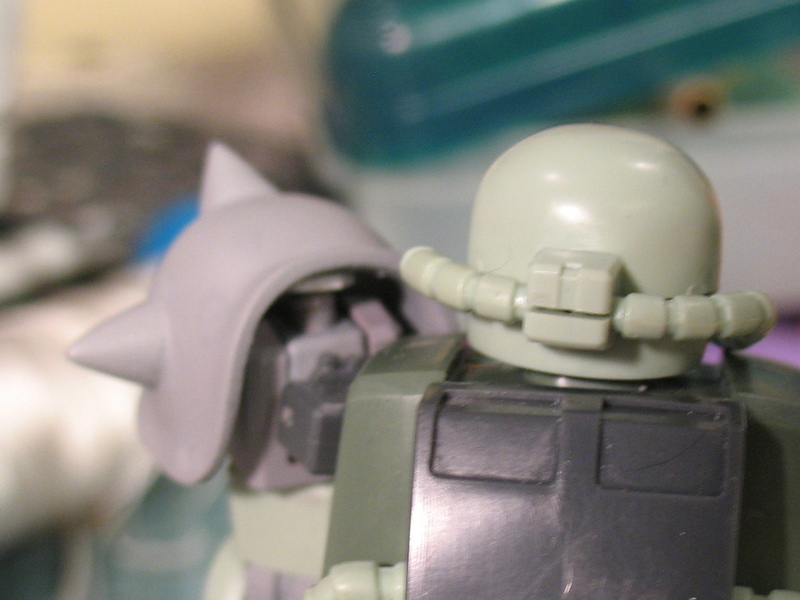 In all the previous photos of this project, when the shoulder armor part was mounted on the figure, it was actually just stuck on there with a bit of clay. 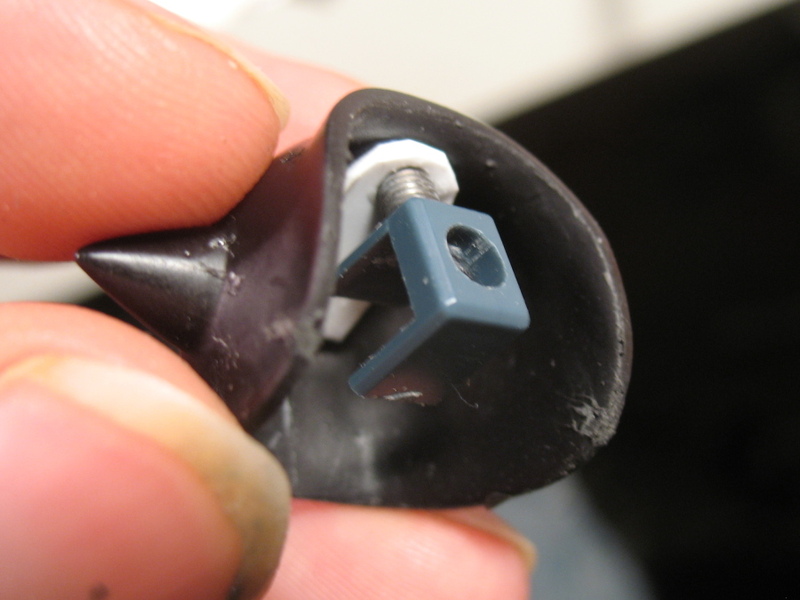 I didn’t want to do any work mounting the original part because I knew I’d be casting it. So once I finally got some cast parts to play with, I started working out how I would mount them. 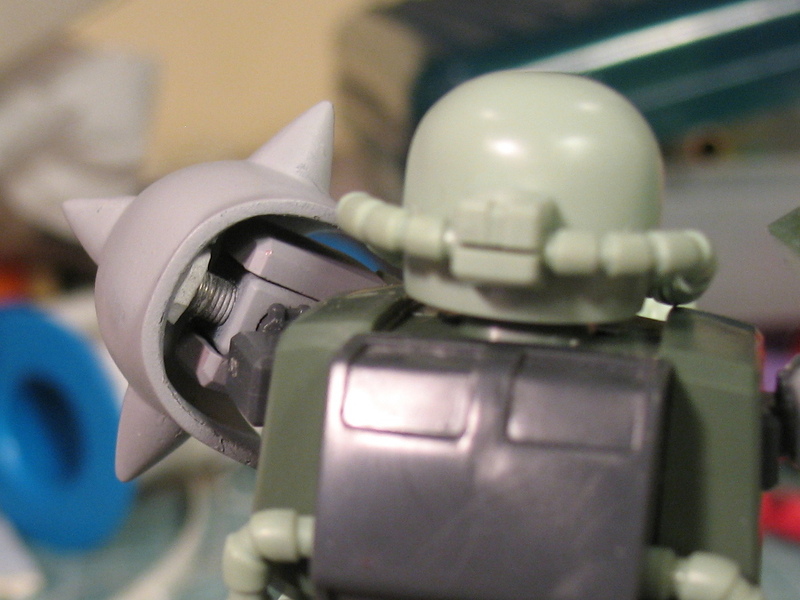 Space was a major issue with all these attempts: but more than that, putting those hinges in makes the shoulder armor fiddly. 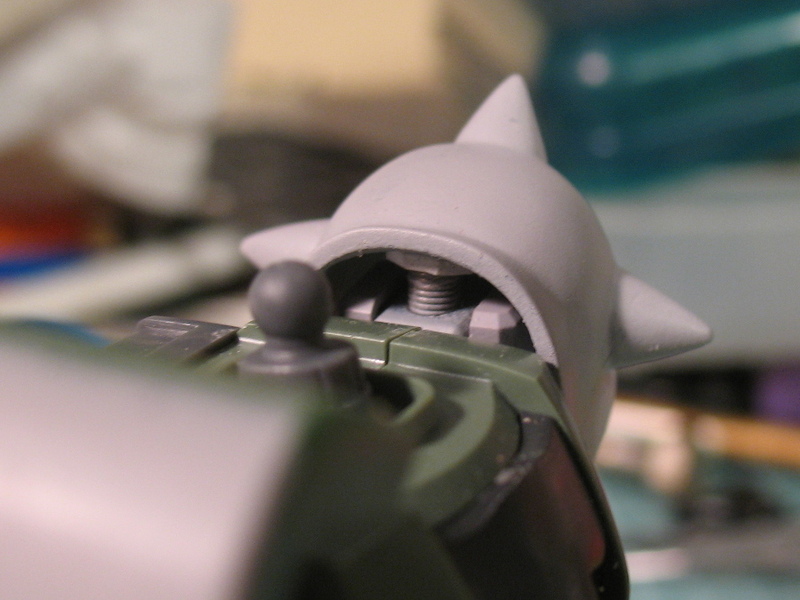 I wanted something nice and simple: so I tried using a spring to connect the shoulder to the spike armor, and attaching the spring to the shoulder’s joint cover instead of the shoulder itself. 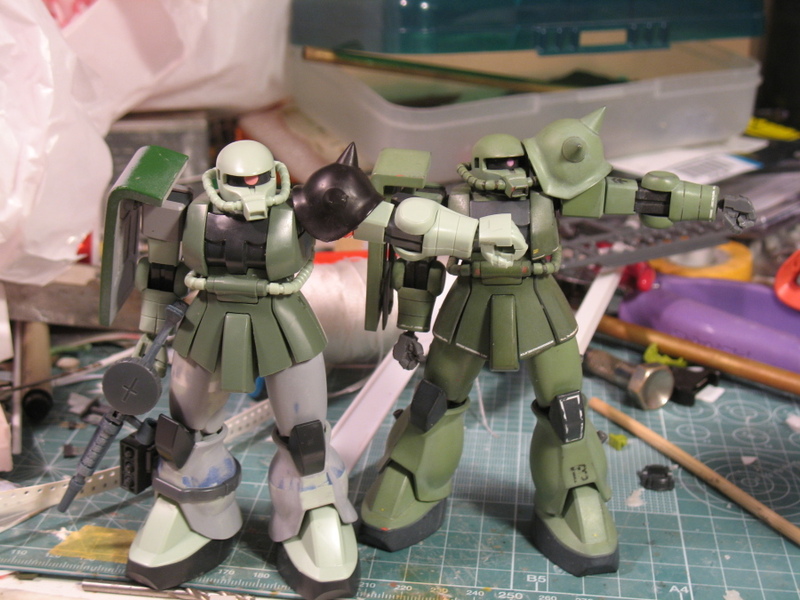 This approach seems great so far – the arm gets good mobility without the spike armor winding up in the Zaku’s face, and the spike armor returns automatically to its natural pose due to the spring action. 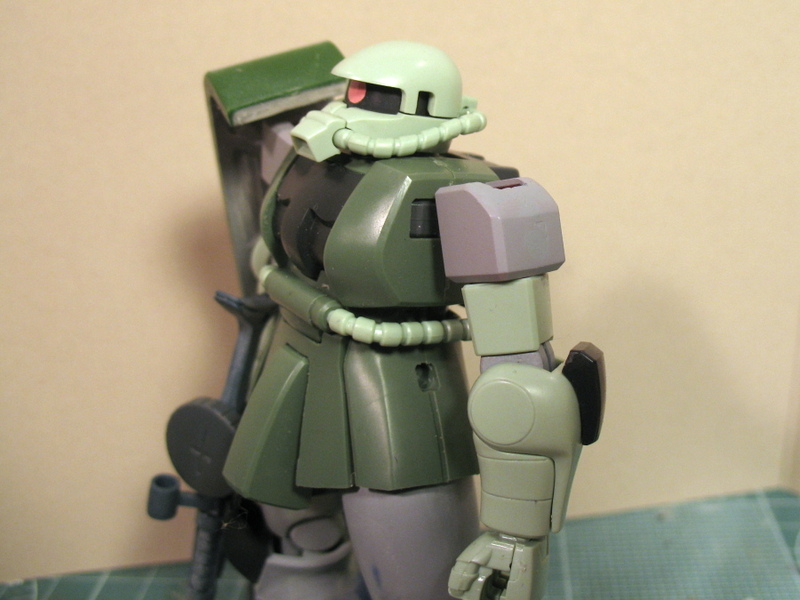 Really, after mounting the Zaku shoulder armor this way, I feel like Bandai’s approach for the last 15+ years has simply been flat-out wrong. 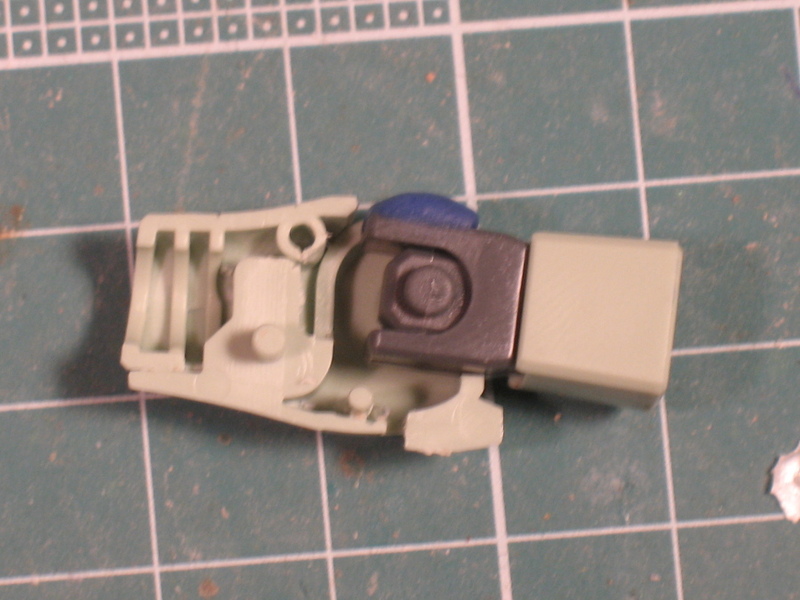 The shoulder part I used for all these experiments was one of the ones left over from my second HGUC Char’s Zaku… Once I had the part working with the spike armor mount, I decided to go with it instead of repeating the modification on one of the parts from this kit. When I can, in this project, I try to make sure I have a way to back out of a modification if it doesn’t work out. Unfortunately this also means the part I’m using has two drilled holes that need patching up, in addition to the basic resurfacing of the cut-down areas. 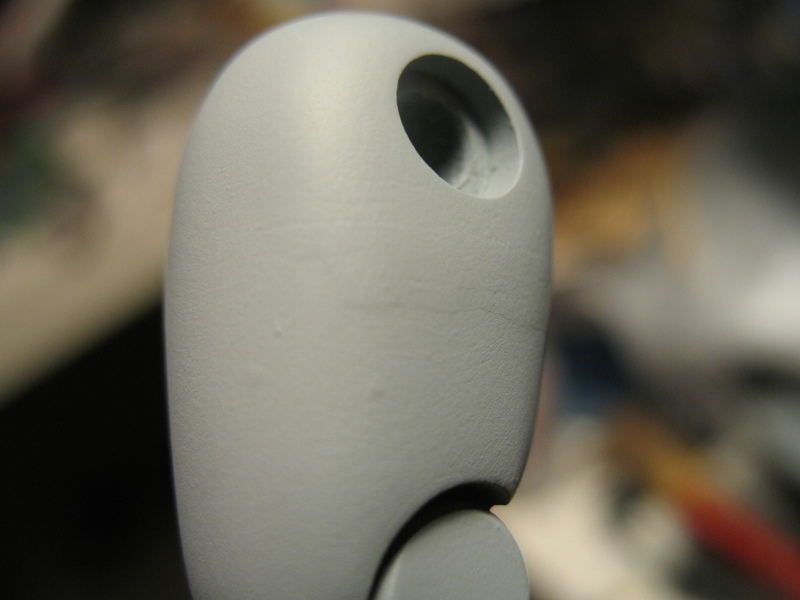 One last modification I did was to add some epoxy putty to the elbow joint cover to give it a little curvature and blend it into the shape of the arm. 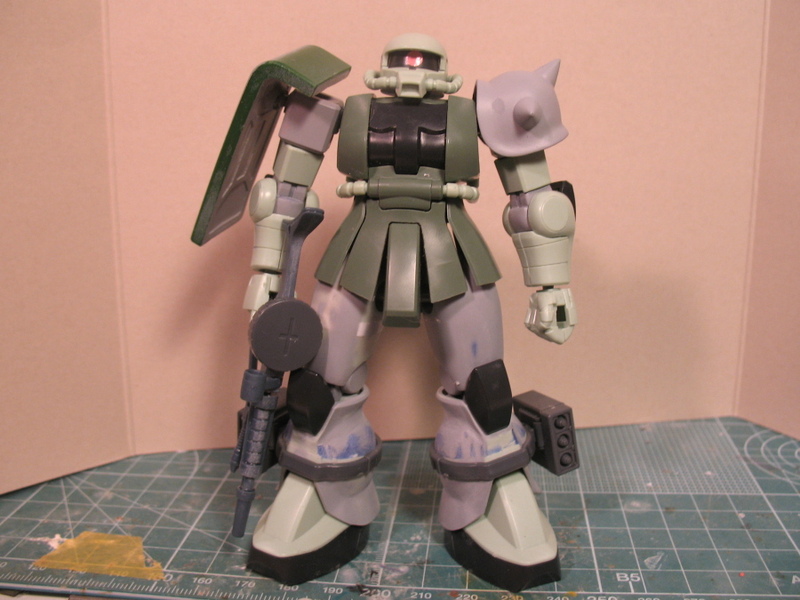 This is based on a similar modification I did with the HGUC Zaku FZ before I decided that kit isn’t worth building. It’s kind of simplistic but I think the effect will be good once it’s painted up. 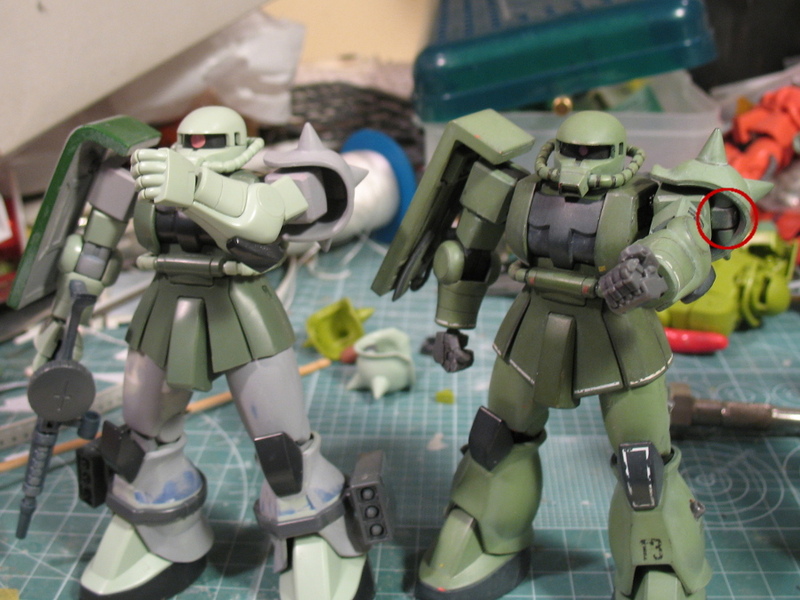 I’m thinking of actually making those elbow joint bulges a little more prominent, possibly adding some on the back of the elbow joint as well – I’m not really sure. 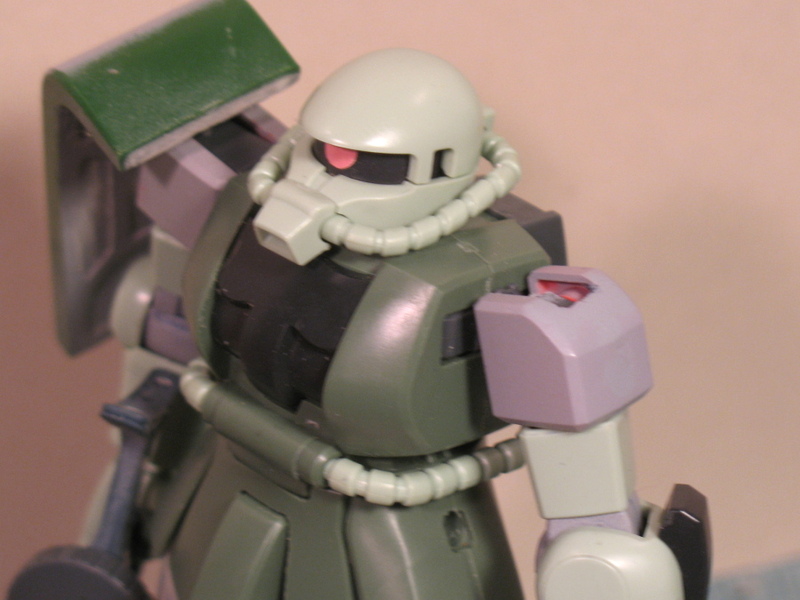 But I feel like that flat gray rectangle of an elbow joint cover doesn’t really fit in with the curvy forearms and so on. I’ve still got a fair bit of cleanup to do on the recast spike armor, and I can’t really say the leg work is done either (I haven’t gotten around to re-priming the legs to see if they need more work) – and once I finish that I still need to mount new leg cables, light the monoeye and get set up with some replacement hand parts… so there’s plenty in this project to keep me busy for a while. 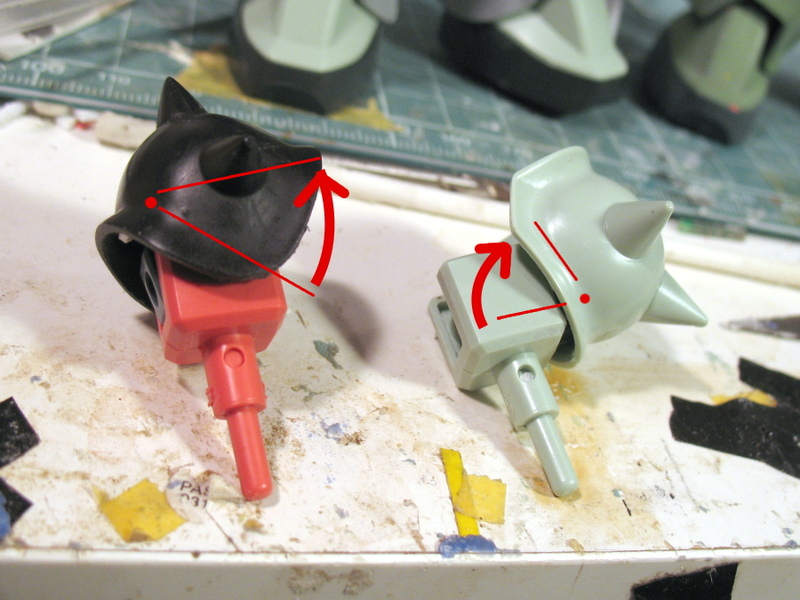 I really like the epoxy putty curved elbow modification, a simple way to bulk up the joint and still have that level of movement. The spring mounting of the spiked shoulder armor seems overly elaborate but it looks to work well. 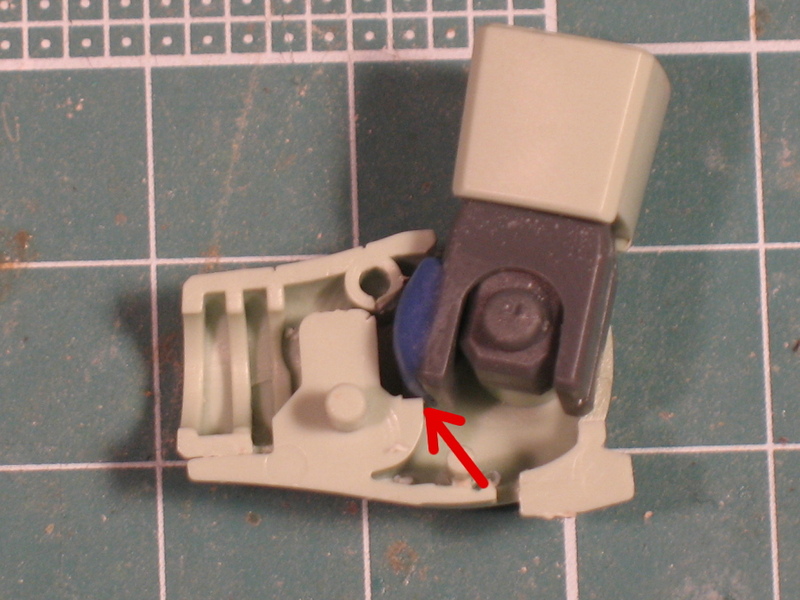 Does the spring press the shoulder armor against the other parts to rub any parts near the arm and torso? 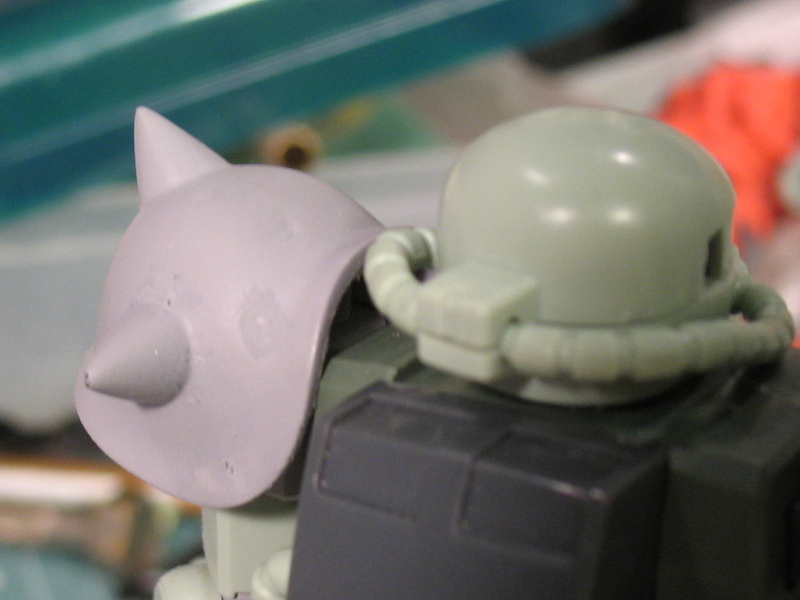 As for part-to-part contact, the shoulder armor does come into contact with the side of the chest block (as it does on the stock kit, in certain poses) but I wouldn’t say it’s pressed against there. The spring’s not under tension unless the arm’s extended. When the arm’s extended laterally past about 45 degrees, it’ll come in contact with the lower edge of the spike armor – and beyond that it starts flexing the spring. So there’s some potential for wear there (and, notably, there’s potential for wear on the upper arm that doesn’t exist with the stock mount) but compared to the stock mount I think I’ll come out ahead. 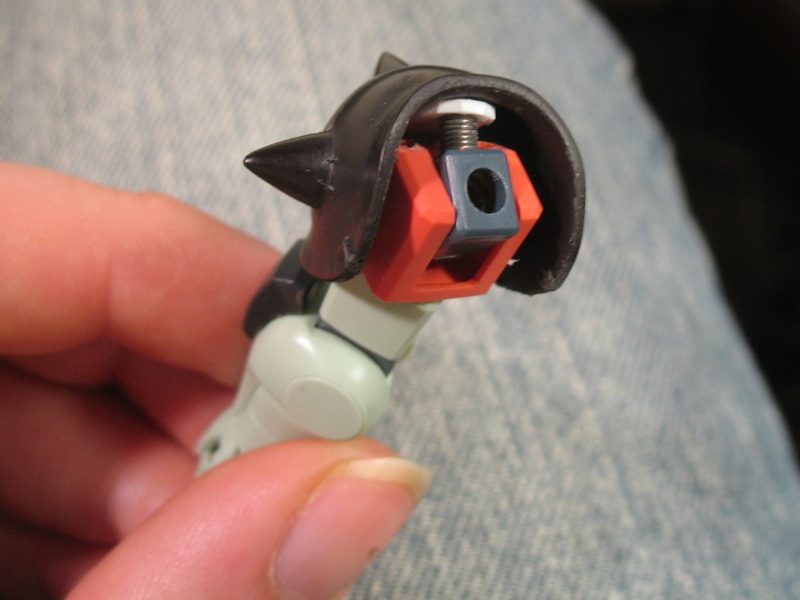 With the stock mount, lateral extension basically jams the shoulder armor against the chest block unless you move the shoulder armor first. 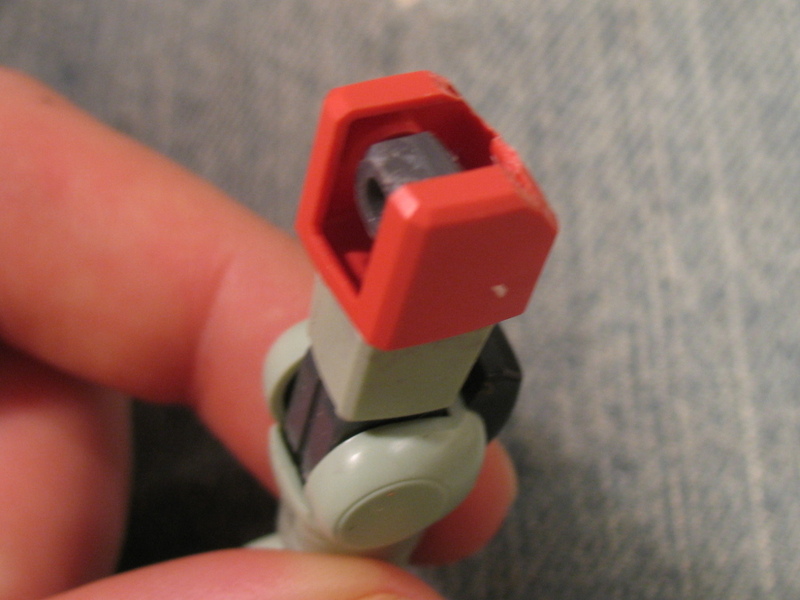 I have a few little paint nicks on my #13 HGUC Zaku as a result of this. 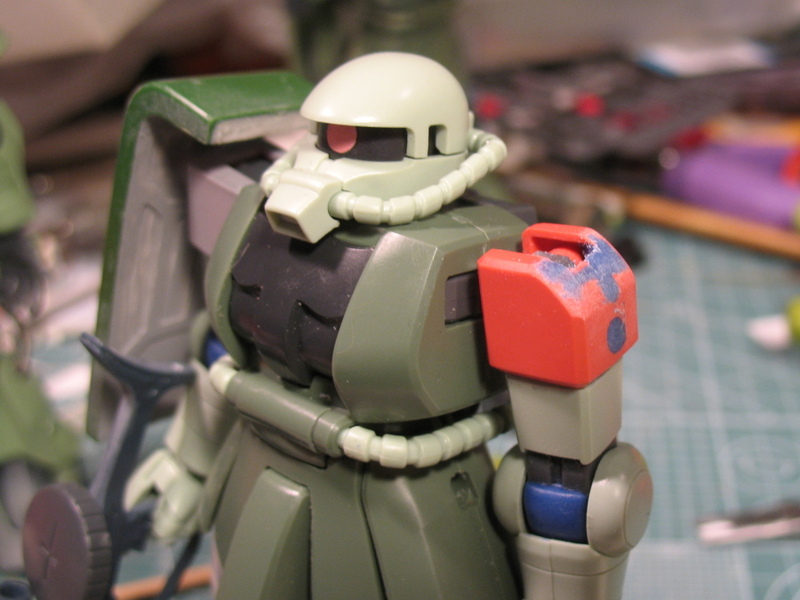 I don’t think I’m going to get much of that with the spring-mount, and wear on the upper arm is mostly just going to be an issue if the arm is moved around a lot in the extended position.